Optimus Defense Safe Rack Deluxe Kit is perfect for medium size gun safes or as a starting package for your gun safe rack. This modular gun rack system uses different size gun rests that fasten to a 8020 rail section, allowing for optimal spacing that can be easily adjusted. 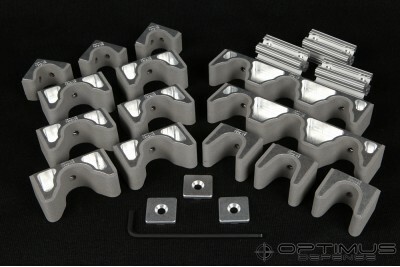 When combined with 8020 rails (OT021), this kit can form a E-shaped rack that can hold up to 18 long guns. This kit saves you $108. Rests are wrapped in a grey color Vinyl/Buna-N foam. This firm foam will not harm your gun and will resist most oils and chemicals. For up to 18 long guns in a E-shaped rack. 8020 rail section is not included in this kit. The 8020 rail (OT021) can be purchased by the inch and cut to your specified length.